The community of Spring Valley has been under mandatory evacuation since June 23rd when a fire erupted on the northern end of Spring Valley and threatened the entire community. The Lake County Sheriff’s Office requested the assistance from local law enforcement agencies to assist with patrolling the evacuated areas. Those agencies are the Lakeport Police Department, Clearlake Police Department, California State Parks, California Fish and Wildlife, and the California Highway Patrol. They are patrolling for unauthorized people in the area and contacting them to determine their reason for being in the area. On June 25th, at approximately 1340 hours, Lakeport Police Officer Andrew Welter was assisting the Lake County Sheriff’s Office with patrolling the Spring Valley area. He observed a black Toyota 4-Runner traveling on Spring Valley Road to have expired license plate tabs. 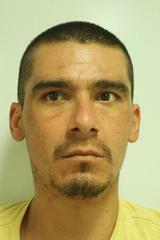 He conducted a traffic stop and contacted the driver, who identified himself as Christian Hiran Campos, 30, of Ukiah. Campos said he was working in the Spring Valley community, but was unable to identify who he was working for or what he was doing. It was determined Campos was an unlicensed driver. A consensual search of Campos’s vehicle revealed he was in possession of approximately two pounds of marijuana and a loaded handgun. Other items found inside the Toyota were a small weighing scale and binoculars. Campos was arrested and booked at the Lake County Jail for being an unauthorized person in disaster zone, possession of more than 28.5 grams of cannabis, possession of cannabis for sale, transportation of cannabis for sale, possession of a concealed firearm in vehicle, unlicensed driver.